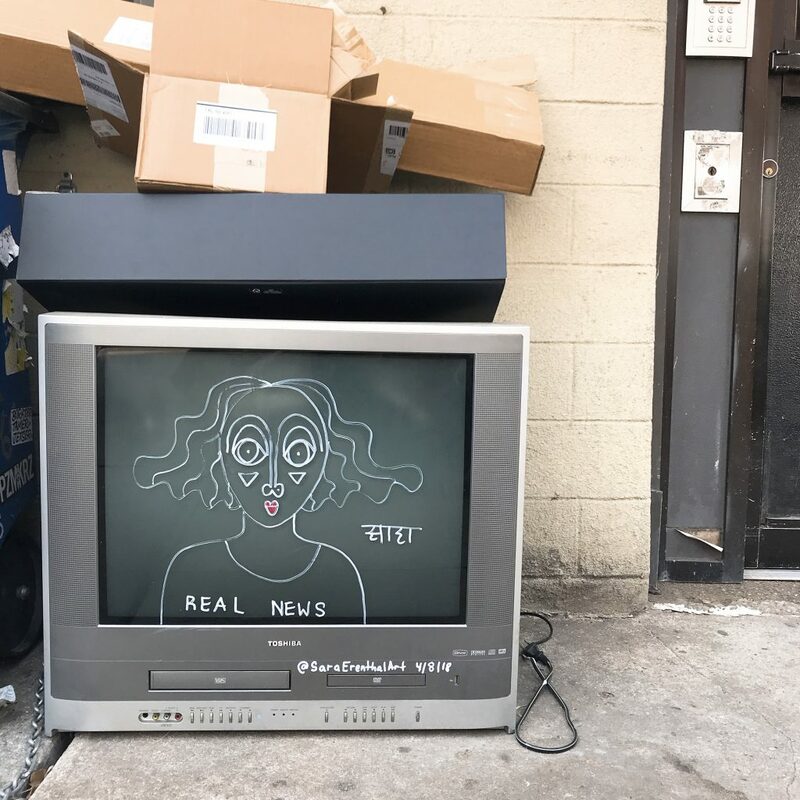 As I walked past my apartment’s trash bins on my way to a cafe to write this post, I came across Sara Erenthal’s street art that turned an abandoned television into an artwork. The word, “Real News,” framed in a television-trash (in a literal sense), immediately captured my attention. When did we start to put “real” in front of the word “news” or “fact” (with or without irony)? Do the words such as “real” or “news” (or fact, truth, etc.) still have as much credibility in the age of the Internet and social media as they used to have (mostly in the age of more traditional forms of journalism)? What constitutes real, fact, news and who approves the validity? Although the contents and the specific contexts of this week’s readings are in a wide-range, I think these are some of the basic and recurring questions. I spent more time than I expected to in doing both close and “lateral reading” (Sam Wineburg) of this week’s articles (i.e. following the hyperlinked texts, Googling some names or websites as suggested, skimming through the Wikipedia talk pages, etc.) and I needed to stop reading at a certain point, because otherwise I wouldn’t be able to write a post. I think this discursive journey reflects the process of reading and writing from/on the digital platforms, as the sources on the Internet are abundant (with or without multiple hyperlinks or further-related readings). Compared to my previous provocation for the ITP Core 1 class, which was a close reading of the chapters 3 and 4 of Paulo Freire’s Pedagogy of the Oppressed, the experience of reading and writing about “digital literacy” already embodies the different nature of knowledge/information production and circulation system. This is more personal remark based on my experience of writing, so if it doesn’t make any sense here I hope I can articulate it more in class. But the reason why I brought up the experiential layer is to emphasize the that digital literacy is a different mode of literacy, thus should be taught differently. The question is, HOW? Sam Wineburg, Barbara Fister, Alex Juhasz all share similar anxieties over the culture built on the Internet–the circulation of misinformation/disinformation. I think all of them are good at identifying the problems and arguing for the changes, but I think the solutions they are providing should be more concrete and specific. Sam Wineburg mentions four steps to “combat” fake news very briefly and generally. His article ends with saying “Schools must prepare kids for the real world instead of shielding them from it,” and I agree with his general idea, but I was not sure if he is proposing an individual teacher’s role and/or more organizational-educational reform. He emphasizes the teacher’s role and suggests, “Make sure teachers are trained on the matter.” However, I think the part of anxiety or struggle over this issue is that “adults” (as opposed to the digital natives) are not sure where we are heading towards, and there’s not always clear consensus on this issue. Barbara Fister’s article is also good at identifying the problems that Twitter, Facebook, Google produce, but again her article ends with “I don’t even know where to start”—which was a bit disappointing to read at this moment. How can we move one step further to think about what we can teach more concretely–starting from where the authors left off? In the context of Facebook data breach and Mark Zuckerberg’s Facebook hearing, how can the educators take advantage of it as a teaching moment? How can we concretize individual educator’s role but not lose sight of the institutional and societal aspects? Who is the sender of the message? What is their motive or intent? Who benefits from the message? What tips and tricks do they use to get their message across? Who is their intended audience? How could others interpret the message differently than you? Do you think we need to add more questions specifically relating to digital media consumption? What are some questions that you can think about to add-on in general or more specifically relate to your field of study? How can we think about digital literacy and digital platforms beyond moralizing ground (meaning beyond just blaming the individuals or organizations spreading propaganda-fake-misleading information)? Do you think “reading laterally” is a good way of critically consuming information? I had an impression (and correct me if I am wrong) that much discussions around digital literacy are still focusing more on words and not much on the visual side of it. What was your impression? I am still at an initial stage of designing my project and thinking about what kinds of choices that I can make. I teach speech communication course at Baruch College which is a mandatory course for all students. In the course, students have an opportunity to deliver four to five public speeches. My role as an instructor is not much about teaching “skills” like a speech consultant, but more about fostering students critical thinking and academic research. I consider public speaking as a form of power. Thus I emphasize the ethical responsibilities as we know what happens when the power is abused. I want my speech communication course can help students empowerment beyond the classroom, and I am thinking about how digital technology can help this process. By delivering several speeches in class, students engage in the process of production and circulation of knowledge rather than remain as a passive learner. Can students engage in the production of knowledge beyond the classroom and can digital platform help it? VOCAT is a good assessment tool to document and analyze students speeches, but can we go one step further? All the Baruch students are taking or will take the speech communication course. How about creating a web/archive of topics that the students chose to present on in their classes to see what their interests are and to potentially take actions with the group of students with similar interest? But my question is: do students need this kind of platform? If there were willing to do so, students have an option to upload it to other social media platforms. Would the educational platform different from it? What are the risks of this idea? Unlike writing in digital platforms, the stake of uploading the recording of one’s vulnerable self is different. I also thought about social annotation for speeches, not for the evaluation/assessment of speech skills, but more about the ideas/contents of the speeches. On a different note, I have been thinking about what “public speaking” means in the digital age. One of my research fields for the Theatre Program’s Second Exam is about the notions of the public (regarding space and people), and my interest in public or publicness also drives me to think about what “public” means in my speech communication course as well as for the ITP project. Is the traditional definition of public speaking from textbooks or from guidelines of the department (which is speaking in front of public and sharing ideas) still valid in the twenty-first century when almost everything is technologically mediated? Can I create a different public speaking assignment that is on the digital platform, speaking to the air, but still to public? If public speaking means sharing your ideas public, what kinds of public/digital activities students can engage with? After all, is public (regarding information and openness) always good? I am also thinking about how I can make this project more towards my research. As I am still developing three distinct fields of study for the Second Exam (I can think about dissertation only upon completing it), I hope I can get clearer ideas later. One rough idea is to visually historicize how our perception of the body on theatrical stages has changed with the new technological developments (i.e. printing press, photography, interactive media, etc.) and how that change (if any) complicated our notions of what is corporeal-natural-biological and what is mechanical-artificial. I plan to delve more into the premodern perception of the body (as opposed to the modern notion of it) and thinking how the different epistemology can help understand discussions around the posthuman. Hi, I am a feminist, researcher, educator, and a dreamer, aiming to become a creator. I am Level II Ph.D. student in Theatre and Performance at CUNY Graduate Center, and I have been teaching speech communication course at Baruch College as a Graduate Teaching Fellow since Fall 2016. I am interested in how different material conditions of technology have influenced the defining, delimiting, and/or expanding the boundaries of the human body, especially as it relates to issues of embodiment and agency from Renaissance humanism to posthumanism. My other research areas include the notions of “the public” and “the political” in/and performance and urban modernities and contemporary performance in East Asian cities (Seoul, Shanghai, Tokyo). I am a current president of Korean Students Association at the Graduate Center and Theatre Program’s Doctoral Students Council Representative for the 2017-2018 academic year. I recently completed Critical Theory Certificate, and I am happy to be a part of Interactive Technology and Pedagogy Certificate Program. If I am not reading or writing, I love to walk around the city, say “hi” to dog-friends, watch theatrical performances, visit nice small cafes, analyze social-media responses, and daydream. I have recently turned 30 (in Korean age; still 28 in US age) and have been obsessed with collecting words about the age 30 from novels, poems, and songs. I hope to file my annotated collection of quotations/words about the age 30 especially from the perspective of a woman (if you have one in mind, please send it to me!) to my blog that I am currently developing. I strongly believe that we need more education about our ethical responsibilities in social media platforms.